Consider the time it takes for the brain to process written language. What impact does the brain's processing time have on reading development? What are the relationships among processing time, reading fluency, and dyslexia? Can time and fluency-related problems be changed? How should intervention be designed to address the issue of automaticity and fluency? This is the path prominent researchers are exploring...searching for solutions to important questions about time- and fluency-related deficits in reading breakdown. In this monumental new resource, experts from around the world present evidence showing that many dyslexic children have rate of processing differences. This is the first book to focus on time and fluency as a second core-deficit in dyslexia and to give you a greater understanding of why some children with dyslexia don't respond completely to phonological-based treatment. Based upon a recent working conference, this volume offers you the expertise of cognitive, clinical, and experimental psychologists and neuro-scientists. These researchers examine evidence on timing deficits in dyslexia at the behavioral, neuronal, brain structure, and genetic levels and link the research to current intervention on fluency. 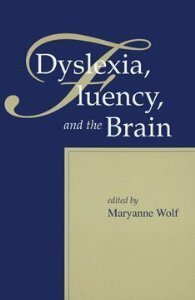 "This volume grew out of a conference held in Crete in 2000 and sponsored by the National Dyslexia Research Foundation. Forty-one international specialists from the fields of cognitive, clinical and experimental psychology, and neuroscience contribute 17 chapters exploring critical questions about time, fluency, and intervention in dyslexia. Coverage includes the nature and extent of rate-of- processing, time-, and fluency-related deficits in developmental dyslexia; the hypothesized source(s) of these deficits; the amenability of time- and fluency-related deficits to change; and the theoretical principles which should guide intervention in these areas. Annotation c. Book News, Inc., Portland, OR (booknews.com)"